It is ... but also other's. Learn to scan a thread and you'll see I'm not only. Then that's theirs too, I know as many that loves it. Your dislike depends on it being pvp or the matchmaking sucking? If it's the first nothing to do about it. If 2nd, you are right. That's still a pending issue. I'm tired of this game turning into one big PVP joke. It USED to be fun, plenty of pve, a little pve ... now it's just one big who's is bigger fest ... continuously forcing a user to battle someone else is not fun. Hopefully, if they keep going down this path they'll go under due to their constant stupidity. Then I shall laugh at all the whales who spent thousands on nothing. Not to be a Debbie downer but the game already has multiple arena settings. I already do not like regular arena, ship arena or TW. I just like collecting the chars now, raiding and some of the events. I really am not interested in another time dump arena thing. Look you are on a purely subjective area. I would argue same as you that pve is stupifingly boring for me since I need to put zero effort in it, can do it in brains off mode. And I wouldn't do it if not for the resources and progression. You can't seriously expect them to not deliver something you don't personally enjoy. Or you can find a game that's purely pve, this game is not it. Anyone who doesn't like pvp doesn't have to participate in it. I'm hoping to start off facing one these "this is a time sink/this is stupid" people, for a nice easy win. Haha. I don't have a lot of faith in myself here, but sounds awesome regardless. This many? Current table only has 2 squads needed. The update snapshot shows 4 squads on one side of the blue end, assumption is 4 squads on the other, so 8 squads is most likely possible. I think the number of squads varies by GP, but if you are posting on this forum, you are probably not 500k GP, so a decent amount of squads probably required. If I click on section it has 5 squads each 10 squads total for defense. Im not much into using lvl 50 characters with lvl 3 abilities. I'm seeing 2 territories in defense with 5 member squads. You see different? 4M gp here. There doesn't seem to be an unjoin button. The UI forces you to click Join. You can't back out of it. So it seems like they want everyone to participate. I don't want to participate but I don't want to make my opponent to deal with a non-combatant. That would cheapen the experience for someone that wants to take it seriously. Squad size is probably a reference to the possibility of 3v3 options mentioned. 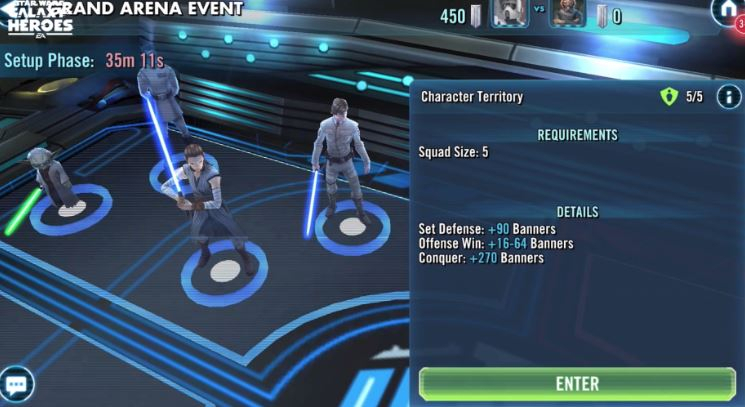 In the update, you can clearly see 4 different squads on one side of the blue defense. I would assume these are 5 person squads, so 20 toons per side, 40 toons total or 8 5 toon squads. There was also a reference (can't find it) to the possibility of 10 squads for higher GP. So that is a lot of squads, more than 2 unless I have missed something. Am I the only one who is getting sick of PVP crap? I mean seriously. How many different ways do we HAVE to fight other people. Let's think of this logically ... TW is quite possibly the worst addition ever added to this game. Now, you're giving us our own personal TW ... why? WHY??? I get tired of having to fight other people. My satisfaction in a game isn't based on my ability to beat someone else. Add more PVE, since currently there ISN'T any! Get a usability expert for God's sake and actually do some market research. So we know ships are included now. My next question is how many spots will there be for them? If it’s only 1 each side that’s kind of a bummer, because many of use have well more than 2 teams developed, and it’s a shame to not get to use them in a mode like this. On the other hand, if it’s 2 each side (offense and defense) that means there is 0 room for error, because we only have 4 capital ships. The entire match could be decided by those 2 ship battles. I think I admire your attitude but I'm not entirely sure. It's confusing. I agree with this. I have no desire to play this mode, but the game forced me to sign up. I have no intention of participating, so why should my desire to play my way negatively affect another player who wants to play Grand Arena? A Drop/Unjoin button needs to be added like there is in TB. I don't care that much about PvP and I don't want to participate in GA. I also don't want to take away any enjoyment from someone else who does like PvP. So I'd like to be able to unjoin the GA. That's about it. Just pointing out , this “first” ga is only a single matchup , one opponent, one fight. It’s basically A trial version for everyone to see what ga is like, Once this first time only trial is over, rest assured the future 8 player match ups will be optional. I don’t think its the actual join in period yet,since its more than 24 hours. Its counting down to the player lock in. I question whether any of the devs even play this game. If they did they would see this game is in need of a facelift, a toon refresh in the stores, revamp Iightside & darkside missions to actually have a story, add KOTOR missions that follow a story, rework Galactic War table and add a Death Star raid for ships. I don't have any desire to play this mode, but there's an auto set function so if you don't want to play you don't have to. Second place rewards for doing nothing is fine by me. So it really is no big deal. If you don't want to participate then don't. I am so pumped for this mode! I can't believe there are people who dislike the PVP in this game. Its the best part. This is not pvp. You don't fight against another player. Just a team determined by another guy and played with a poor IA. It is just a **** content (best toons. best mods). It’s still PvP. And the point he was making is spot on. This content will scale in difficulty infinitely. It will never really get easier or harder. For many, myself included, that continuous challenge is what makes it fun. For others, the inability to ever conquer it and move on makes them uninterested. It just depends on your style of gaming. That you were forced to join was only this first time, for the kind of tutorial mechanics that come with every new game mode. See it as the test run that it's obviously meant to be, and the more players participate, the more profound can an analysis be afterwards (including bug fixes and such). You can place a defense which is not that much work, so your opponent will have something to fight against. Then you don't have to attack if you don't want to - but you could still just give it a try this first time, and if you don't like it, next time there will be no "forced" join anyway. Missed most of the hubbub, so much so last night was the first I heard about it. Guess I'll see if it's something else I can largely ignore or not. I doubt I'll have that much success given how lopsided my roster is currently. Actually, this game is only pve. You never ever actually play another person in any mode in this entire game.